Cruising is something you learn as you do it more and more. Every time we cruise, we learn more and more. I love sharing what I learn with you to give you a head start, because cruising is awesome. Words mean a lot on a cruise ship, and you will hear different vocabulary used so you want to learn because your Cruise Director will announce this stuff! You know you are on a ship and it is a great vacation, but your cruise has more to offer than just life aboard the ship, in fact, the places you are about to visit are awesome, but you gotta know how to access the fun! It was Day 2 of cruising and we were at our first Port of Call! Do you know what happens when you get to a Port and the ship docks? When we first cruised, years back, we used to get up early to watch the sun rise, or perhaps we were already up from having a party all night(we were a bit younger, lol!) and then we would catch an early breakfast and then of course watch the ship navigate into the Port we were heading into. We were novices at cruising so we just considered ourselves headed for a destination, but it is known properly as a Port of Call. We also learned what we items we needed to get on and off the ship(you don’t want to forget these) and how we would use the Gangway! I would love to share with you what happens at Ports of Call, excursions, what you need to get on and off the ship, and how the Gangway serves as your departure destination into the truest adventures you will have on your cruise, as we lavishly live cruising out loud. A Port of Call is actually your itinerary, your destination, where your particular ship is headed and the island or country that you will get to uncover and discover for that day. 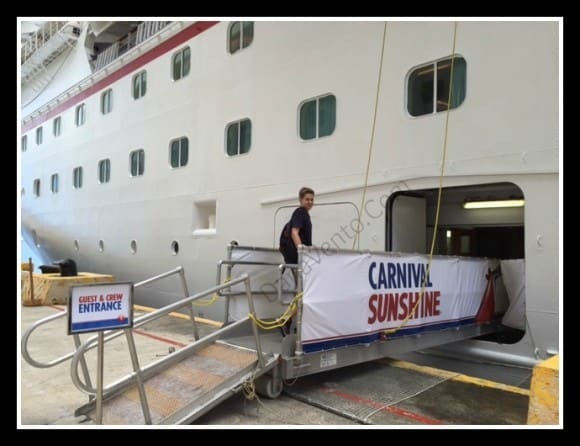 In most cases you will dock early in the morning and shove off by late day (with Carnival it is generally around 6P, however this changes cruise-to-cruise and port-to-port). Ports of Call are where the ship will dock (or as close as possible because sometimes it is not possible to actually dock at port). The ship will remain in this area, at this ‘parking spot’ from X AM time to ‘X’ PM time and during this time you are free to explore the island,country, area and then you must return as the ship will leave that Port of Call at the designated time. Get off the ship and take part in an excursions(there are two kinds of excursions, Ship supported and Private). Your Ship Supported Excursion will tell you where to meet, when to meet and makes it very easy for you to get to the most popular points on that particular stop. 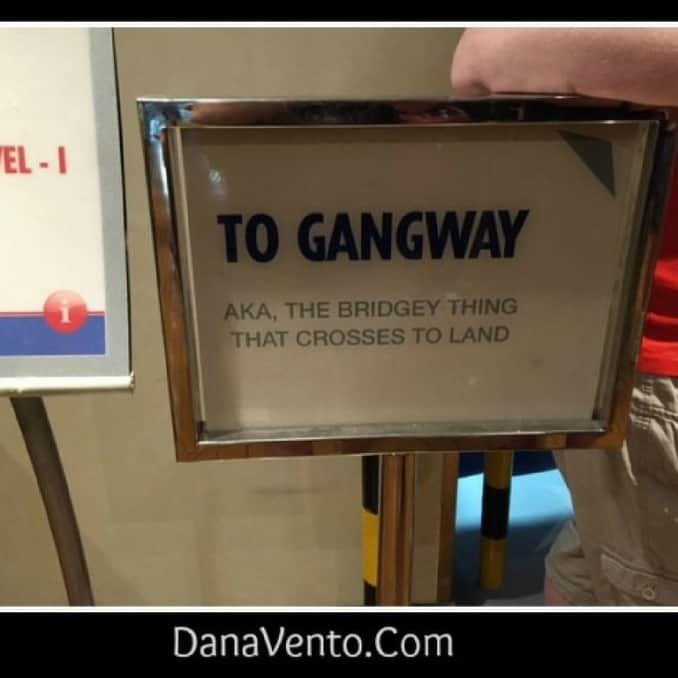 The Gangway is your area that gets your off the floating ship, to dry land. You often will walk across a small bridge (with water underneath) and get to the actual flat land to walk to all the shops or excursions. In our case, we had to, but we listened to our Cruise Director who told us the Gangway at the FRONT of the ship and we followed the crowd (lol)! This is my one son getting Back on The Ship after a day in port! 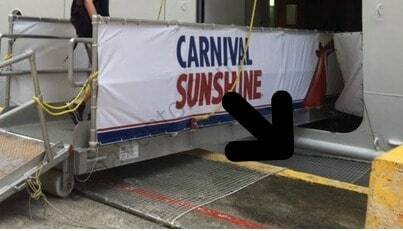 Here’s a few things to know about the Gangway, you want to be organized because people are moving in lines and moving on OUT of the ship, and you don’t want to get in the way or drop your stuff. 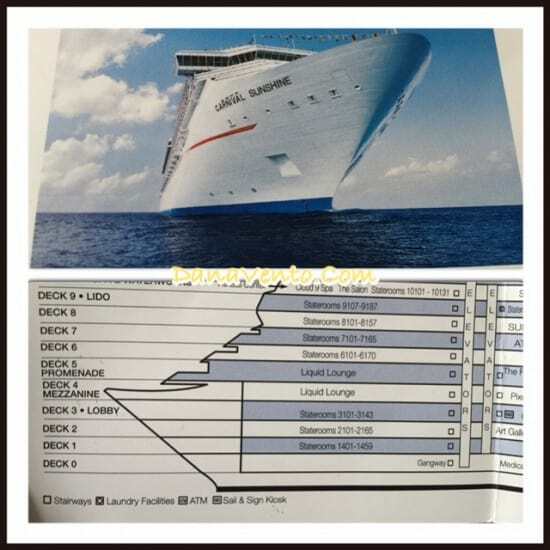 If you took the steps, keep following your line of people and have your Sail & Sign Cards ready to get scanned on the way off the ship. You will need these to enter the ship as well, and in addition, you may or may not need your passport (we used color photocopies of our passports rather than chancing losing them on our excursions). Don’t forget to have your well-packed shore excursion bag with you, which I discussed in another article, you can read it HERE If you forgot what you need when heading on those excursions. Now that you have used your Sail and Sign ID and you are headed off to shore, you are going to walk on this little bridge. This bridge has advanced leaps and bounds since we started cruising, let me tell you! The biggest and best thing about it, is the netting under the bridge, this was not there back in the day, it is kind of a way to help you all out! If you get so excited to look at the Ocean below your feet, or the port ahead of your feet, you drop your bag and boom it’s all gone… NOT! This net will be your save all, or save some. Your day will be sensational at the Port of Call if you understand when you need to be back, and where you need to board. Additionally, remember the items that you have in your bag on the way in are subject to search and seizure (if inappropriate). If you purchased alcohol, you will be giving that to the attendants on the Gangway and then receiving it back when you are packing to go home! You can lavishly navigate your cruise if you understand Ports of Call, Excursions and The Gangway. Happy Cruising. I haven’t been on a cruise for forever, but my husband and I want to go on one for our anniversary next year! This is great info for us! Shannon Peterson recently posted..Amazon Lego Sale! I have never been on a cruise before but it looks like a lot of fun although I would have to take a lot of travel sickness tablets. I’ve always wanted to go on a cruise I think it would be so much fun. I love cruise trips but never been to carnival cruise.. I have been to Singapore cruise. I love cruise trips but never been to carnival cruise.. I have been to Singapore cruise. It was so much fun. Excellent tips! Cruising is my favorite way to travel. The last cruise we did was through the Panama Canal and it was so much fun. These are good to know. I have never been on a cruise, but I will save this for future reference. I never would have thought there’d be so much to think about when it comes to getting off the ship! You’re giving such great cruise info on your blog lately. You make cruising sound such an adventure, I really have to move it up on my bucket list! Claudette recently posted..Clarity From Chaos: Free Yourself! I’d be worried that I would miss the deadline to get back on board. I’d still take the chance to go shopping. Going on a cruise is one of my lifelong dreams. We cannot afford one right now, because my husband just had hip replacement surgery and he needs to go to physical therapy to get him mobile again. Thanks for sharing your experience. I hope one day, we can go on one of those Carnival cruises. I heard there are time wherein you’d have to go to the port through a smaller boat instead of the ship “parking” near enough the port so they can set up a gangway. Anyway, thanks for the info! Glad you guys enjoyed! Love these posts. You are making me want to go on another cruise. What i great adventure. I want to go on a cruise thanks for sharing this fun and cute things. I love cruising! It’s been years, but I remember every moment of the fun and ease of cruising and I highly recommend it! I want to go on a cruise! Thanks for showing me these unique things. Tara. I want to go too! I am so ready for a vacation.. Kids and school and activities are draining! I’ve cruised twice! Both awesome experiences! I’d do it again just as soon as our kids are a bit older. I’d love to take a family cruise! I used to want to go with just my husband, but it doesn’t look like we’ll ever be kid free for any extended period of time, so might as well take them with us! LOL! I love hearing all your adventures on your cruise! Sounds like a blast.